PT Kalbe Farma Tbk - Kalbe (IDX : KLBF) or referred to as "Kalbe Group" is a leading and reputable public-listed company in Indonesia, running business in the field of integrated pharmaceutical industry. Based in Jakarta, Kalbe Group has strong business competencies 4 business pillars, namely prescription pharmaceutical division, consumer health division, nutrition division, and distribution & logistics division. 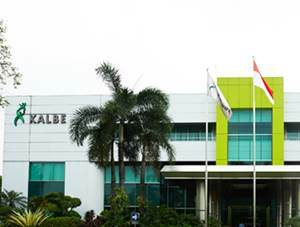 Kalbe Group was formed in 1966 and initially as a garage-operated pharmaceutical company. In 1991, Kalbe Group conducted its initial public offering (IPO) on the Stock Exchange. Kalbe Group's shares are registered under stock code KLBF. As of December 2016, PT Kalbe Farma Tbk is 10.17% owned by PT Gira Sole Prima, 9.66% by PT Santa Seha Sanadi, 9.49% by PT Diptanala Bahana, 9.47% by PT Lucasta Murni Cemerlang, 9.21% by PT Ladang Ira Panen, 8.50% by PT Bina Arta Charisma, and the remaining is held by the public (43.50%). As of December 2016, Kalbe Group conducted business operations in all parts of Indonesia under the management of 2 Regional Distribution Centers, and 71 branch offices. Kalbe Group also supported by 35 subsidiaries/affiliated companies. According to PT Kalbe Farma Tbk Annual Report 2016 as cited by JobsCDC.com, Kalbe Group booked positive growth in 2016. Kalbe Group registered a 8.3% growth in total sales value of Rp19.40 trillion as compared with Rp17.9 trillion in 2015. Referring to its annual report, Kalbe Group was able to record net income of Rp 2,300 billion, an increase by 14.77% or Rp44 billion from Rp 2,004 billion in 2015. Background in Bachelor degree (S1) from Information System, Information Technology, Computer Science, Industrial Technology, Informatic Management with min GPA 3.00. Fresh Graduate are encourage to apply. Familiar with Microsoft Office and SQL. Good analytical thinking and problem solving. Willing to be located in Cempaka Putih. Apothecary Program with min GPA 3.00. Demonstrated good communication and interpersonal skill. Strong knowledge about Quality Assurance in pharmaceutical industry. Willing to be located in Pulomas. Background in Bachelor degree (S1) from Pharmacy or Apothecary Program with min GPA 3.00. Have regulatory knowledge for pharmaceutical and medical devices. Good communication, analytical thinking, and problem solving. Background in Bachelor degree (S1) from Industrial Technology, Pharmacy, Apothecary Program with min GPA 3.00. Have a good knowledge about SCM. Good analytical thinking, negotiation, and communication skills. Willing to be located in Pulogadung/Cikarang. Background in Bachelor degree (S1) from Economic, Finance/Accountancy, specializing in Corporate Finance/Finance Management with min GPA 3.00. Strong Microsoft Office skill (especially with Microsoft Excel). Familiar or have experience worked with Oracle. Strong analytical and logical thinking. Independent, detail oriented, and organized. Have a good interpersonal skill. Background in Bachelor degree (S1) from Computer Science, Information Technology, Computer Engineering, Telecommunication Engineering or equivalent. JobsCDC.com now available on android device. Download now on Google Play here. Please be aware of recruitment fraud. The entire stage of this selection process is free of charge. PT Kalbe Farma Tbk - D3, S1 Fresh Graduate, Experienced Staff, Supervisor Kalbe October 2017 will never ask for fees or upfront payments for any purposes during the recruitment process such as transportation and accommodation.